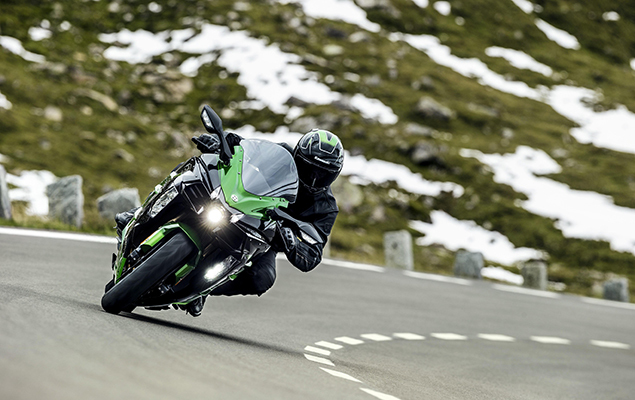 ‘Supercharger’ – the very word is exciting, so it’s no wonder that Kawasaki’s all-new, flagship H2 family have been one of motorcycling’s biggest buzzes in years. They’re the first mainstream, forced-induction motorcycles since the ‘80s and boast mind-warping power of up to 300bhp, alongside mouth-watering style and specification. But while Kawasaki’s original H2 and its track-only brother, the 300bhp H2R, grabbed the initial headlines back in 2015, it’s this new SX variant – which comes in standard or uprated SE trim, as seen here – that’s certain to grab the most sales. Where the two originals were out-and-out performance hyperbikes, with all the extremes and exclusivity that go with it (including price – the H2 costs £22K, the R a whopping £41K), the new SX is a far more real world machine, yet still has the supercharger thrills and flagship frills a true H2 demands. Firstly, it’s a sports-tourer – so its ergonomics are less extreme and its comfort is more lavish. 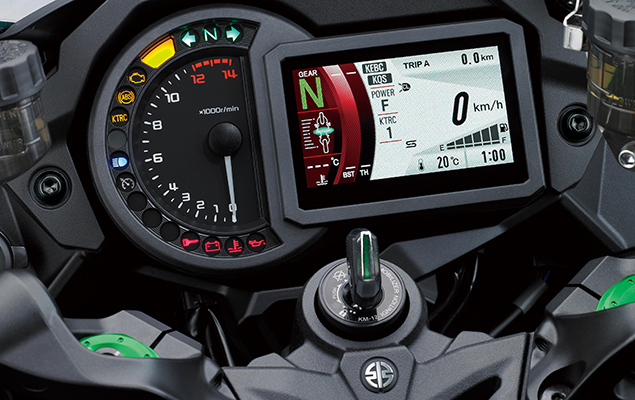 In fact, the SE version not only boasts the stock SX’s excellent ergonomics but also a taller screen, heated grips and a snazzy, attractive, full colour TFT screen. Second, that all-important supercharged, 998cc four, although outwardly similar to those of the more bristly H2 and H2R, has been completely reworked with new pistons, valves, exhaust and so on to give a more flexible, progressive power delivery. But if you’re wondering if all of that somehow dilutes the supercharger experience, think again. Simply, with nigh-on 200-brake plus the low and midrange oomph to match, the SX’s performance is sufficiently blistering to set the hairs on the back of your neck on end. Gun the big Kawasaki hard and the tacho races, your arms tense, the horizon rushes towards you and you’re left with an idiotic grin as wide as anything motorcycling has ever manufactured. In fact, the sensation is so addictive you can’t help but do it again and again. 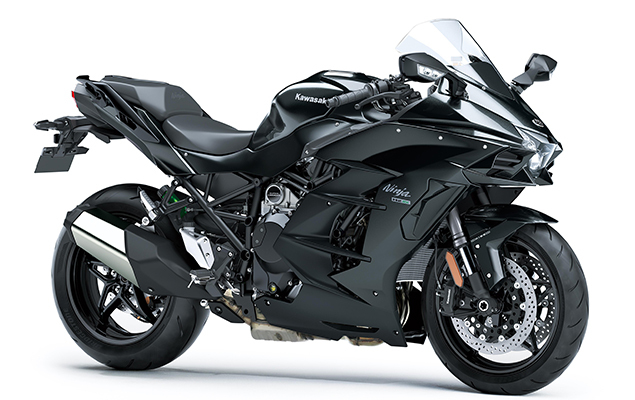 Yes, in pure numbers, that performance isn’t much different from Kawasaki’s own, normally-aspirated ZZR1400. But there’s a sharpness, a litheness with the SX that the aging ZZR can’t match plus, on the over-run, the way the SX’s supercharger chirps and squeaks is simply a hoot. If that was the end of the SX story it might already be enough for some – but it’s anything but. Mix with that performance a chassis that, while no pure sportster, is truly engaging, sweet-steering and accurate without compromising any of its semi-upright comfort. It’s shorter, more modern than the ZZR – and feels it. While just as able as the ZZR at gobbling up straights, on the SX you revel in the bends, too, not even slightly wary of them as is always the case with the long 1400. What’s more, with slick, top-notch, multi-adjustable suspension front and rear, the SX’s ride is just as slick and sophisticated as its powertrain while its big radial brakes are hugely powerful and more than capable of scrubbing off the big numbers the motor put on in the first place. But the icing on the SX cake is its classy, quality, level of fit, finish and equipment. Sure, we were spoilt slightly by sampling the top-spec SE version, which costs a full £3K more than the stock SX and for which you get the aforementioned tall and TFT screens, heated grips, green paint, cornering lights, launch control and quickshifter – but both are mouth-watering bikes in their own right and royalty among Japanese machines. Paint and metal finishes glisten; quality components are everywhere and, while the angular styling might not be everyone’s taste, there’s no denying that they’re striking and eye-grabbing. Like its burly brothers, the H2 SX is no bike for wallflowers. Yet while undoubtedly brilliant, it has to be said that the SX isn’t perfect, either. In this SE trim, some (slightly shorter than my 6’3”) riders have found its tall screen to be quite noisy, while it’s questionable whether it’s worth the £3K extra when the fundamental riding experience is unchanged. In addition, the pillion provision for both is a little cramped and, when ridden hard as most H2 SX’s surely will be, the supercharged Kawasaki is pretty thirsty, too, sometimes returning mpgs in the low 30s. For my money, though, little of that matters. The SX is a brilliant sports-tourer with true hyperbike performance; it’s a worthy sibling to its H2 brethren and delivers as many supercharger thrills as most mere mortals can handle. On top of that it also handles and is more comfortable and classy than any of its rivals. And if all that doesn’t justify its slightly salty sticker price, we don’t know what does. 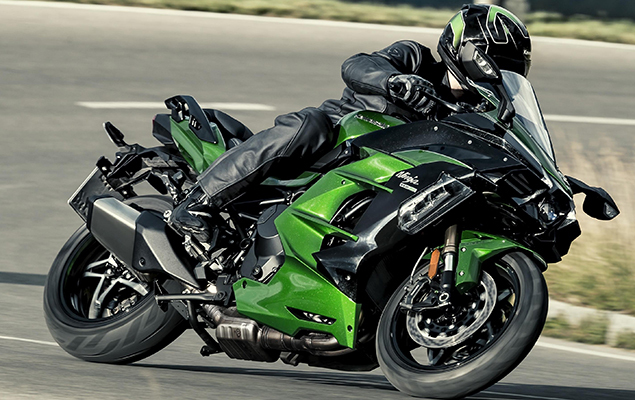 The H2 SX SE’s ‘cornering’ LED lights on each side of the fairing lowers are a true first for Kawasaki. Three lights on each side illuminate in sequence according to the lean angle of the bike and as controlled by the Bosch management system. 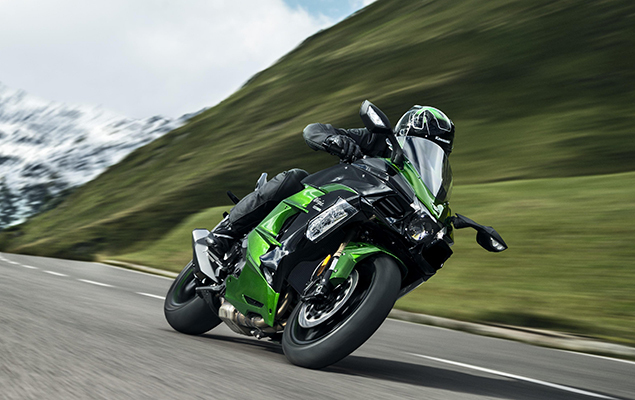 There are not one but two variants of the Kawasaki’s new supercharged sports-tourer – the base SX and this higher spec SE versions which has the same basic 200bhp engine and chassis, but also boasts cornering lights, tall screen, TFT dash, heated grips, launch control plus quick-shifter with auto-blipper.